We collated 7 fungal and oomycete Nep1-like protein (NLP) sequences and used these in a tblastn against the AT1 assembled transcripts (with default settings). The full details of the 7 fungal and oomycete NLP sequences can be provided upon request. The tblastn highlighted three AT1 transcripts with high similarity to known NLPs. The output can be found in the github repository (mixed_material/ashwellthorpe_AT1/blast/AT1_tblastn_NLPs/NLPs_7_tblastn_AT1) along with the sequences of the three transcripts (mixed_material/ashwellthorpe_AT1/blast/AT1_tblastn_NLPs/NLP_transcripts_AT1). We identified one AT1 transcript with high similarity to NLPs, which contains all conserved residues and likely encodes a full length protein sequence. For this transcript we extracted the coding sequence (mixed_material/ashwellthorpe_AT1/blast/AT1_tblastn_NLPs/AT1_NLP1.fan) and the corresponding protein sequence (mixed_material/ashwellthorpe_AT1/blast/AT1_tblastn_NLPs/AT1_NLP1.faa). 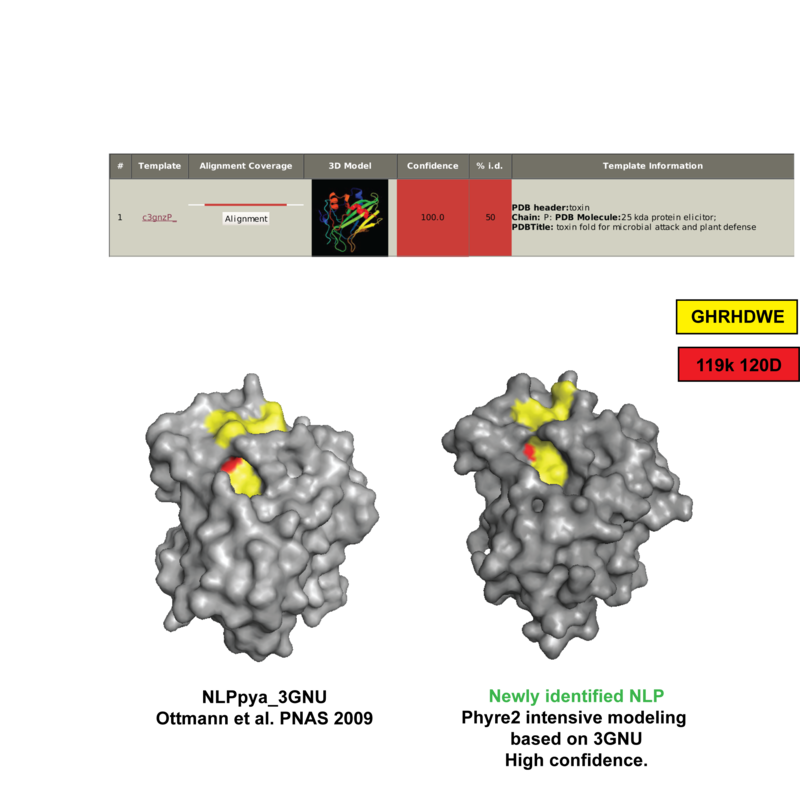 The protein sequence was then used for protein structure modelling using Phyre2, with the published NLPpya_3GNU as a template. This analysis shows that the predicted protein we identified carries all the key residues for NLP cytolytic function.